Palak Paneer is another one of those famous North Indian dishes you’ll find all over India and all over the world wherever Indian food is being made and served. 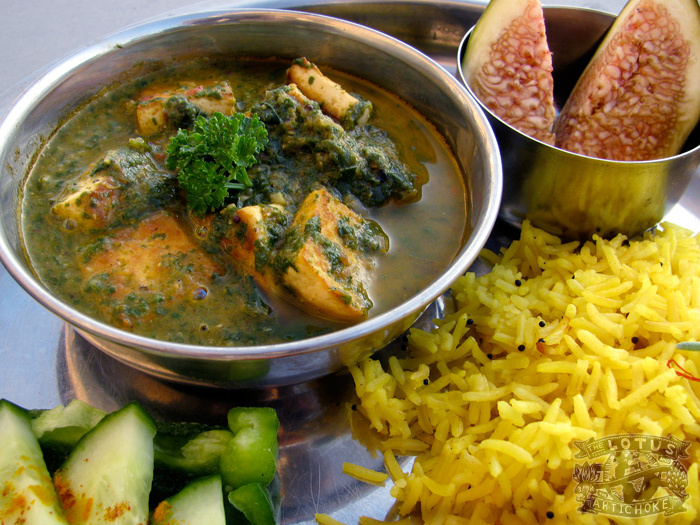 It’s another of my favorites (yes, yes, I have many favorite Indian dishes). It’s also known as Saag Paneer and often found with fried potatoes instead of cheese or tofu under the name Palak Aloo or Saag Aloo. Technically, Saag and Palak are different leafy greens; for our purposes spinach will be fine. I learned to make countless variations of this recipe while living in Amravati, India. It took a lot of experimentation to get it right. Strangely, most of the recipes I found online and even in printed cookbooks for vegan versions with tofu were usually much less than exciting. So I had to do something about it! Pressing and marinating the tofu is essential to making this an interesting curry. The tomato is sort of a secret ingredient in this one. I can’t tell you how many years I was cooking Palak curries and they just never tasted right… until I figured out about the tomato! A touch of nutmeg (usually in most garam masala spice mixes) brings out the flavors nicely. But don’t overdo it! Once I used too much jaiphal (nutmeg flower) while experimenting in my kitchen in India and ended up with a dinner that tasted more like a chai than a curry! Get creative with your spices. Use this recipe as a starting point and then explore. Almost every household in India has a different way of cooking almost everything. Now… find yours. And be sure to tell us all about it! Combine lemon juice, soy sauce, nutritional yeast, cornstarch in bowl. Add tofu cubes, mix well, coat all pieces. Blend tomato and soy milk in a blender or small food processor until smooth. Heat 1 Tbsn oil in a large pot on medium heat. Add mustard seeds, wait until they start to pop (about 30 sec). Add garlic, onion, ginger, curry leaves, coriander, cumin, garam masala, turmeric, hing, sugar. Fry, stirring constantly until onions and garlic begin to brown, about 2-3 min. Pour in puréed tomato and soy milk mix, stir well, return to low simmer, reduce to low heat. Simmer about 10-15 min, sauce will go from yellow-pink to red-orange. Add spinach, mix well, return to low boil. 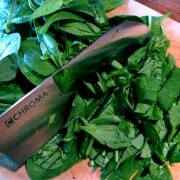 Simmer until spinach has shrunk and is cooked, about 7-8 min. For a smoother palak tofu paneer curry, turn off the heat, blend briefly with an immersion blender. A few pulses will do it! Alternately, you could transfer the curry to blender to purée. 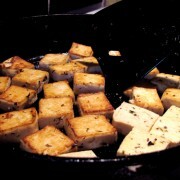 Set pot to medium low, add fried tofu paneer pieces to curry. Add salt. Cook for about 5-7 min, stirring regularly. Continue to simmer, reduce, until your sauce is desired consistency. Serve in a bowl along with basmati rice, chapati or naan bread, or on top of rice. Coconut milk or soy cream (and 1-2 Tbs water) can be used instead of soy milk if you want a thicker, creamier curry. If you don’t do soy, just use nut milk for the sauce and fry up some potatoes instead of tofu. 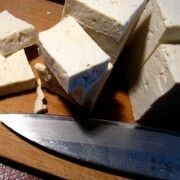 Other wild variations include mushrooms or cauliflower florets instead of tofu paneer cubes or potatoes. Another way to make a richer curry is to add 1 Tbs tomato paste to the spices when frying. This entry was posted in Indian, North Indian and tagged Amravati, north indian, palak tofu paneer, recipe, spinach, vegan, vegan palak paneer. Bookmark the permalink. Grandios! Deine tollen Fotos haben mich ganz hibbelig und hungrig gemacht – und inspiriert. Danke dafür. Ich wollte heute so gerne das Palak Tofu Paneer nachkochen, aber da im Kühlschrank noch Blumenkohl war, der weg musste, habe ich einfach selbst etwas kreiert aus Blumenkohl, Kichererbsen, Süßkartoffel, viel Zwiebel und indischen Gewürzen. Gelbes Linsen-Dhal und Kurkumareis dazu – köstlich. Ich freue mich auf dein Kochbuch! Wenn das deutsche herauskommt, bin ich dabei! Hallo Anja, danke! Das Palak Tofu-Panir musstest du mal probieren! Aber alles mit Blumenkohl und indischen Gewürzen wird auch lecker. ;-) Ich freue mich, dass du auf das deutsche Kochbuch freust! Vorbestellen kann man übrigens eine Woche noch über (Kickstarter) oder schick mir eine Nachricht von “Contact” oben. Würde mich sehr freuen! Vielen Dank Anja, ich habs gerade gesehen! Ich freue mich! I just received “The Lotus and the Artichoke” in the mail and this was the first recipe I made. It was fantastic! I had to double the recipe for my hungry family of four, and the only bummer was there were no left-overs for me to eat for lunch today. Thanks! Thanks for letting me know, Karen! 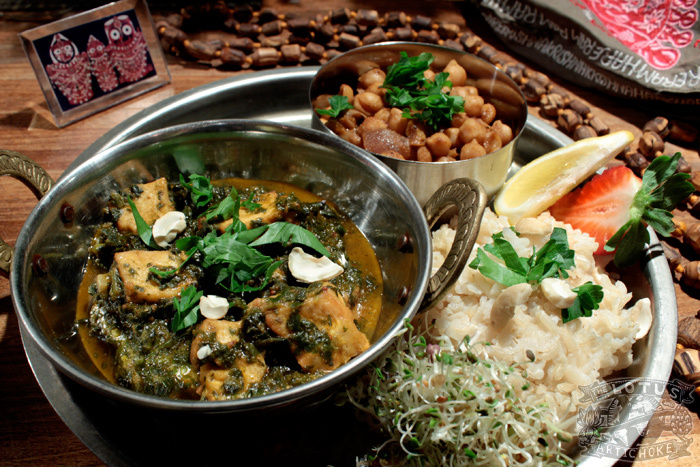 I’m so happy to hear the Palak Paneer was a winner with the family. We make it quite often, too. Super tasty, and goes together quickly with a bit of practice and nice cooking music. Let me know what you make next time. Can’t wait! Do you send these cookbooks to New Zealand? This all looks absolutely beautiful! Thanks, Natasha! I ship to New Zealand and other countries all the time — I’d be happy to send you a cookbook!